Add a sense of age and permanence to your garden by giving your terra cotta pots an aged look. 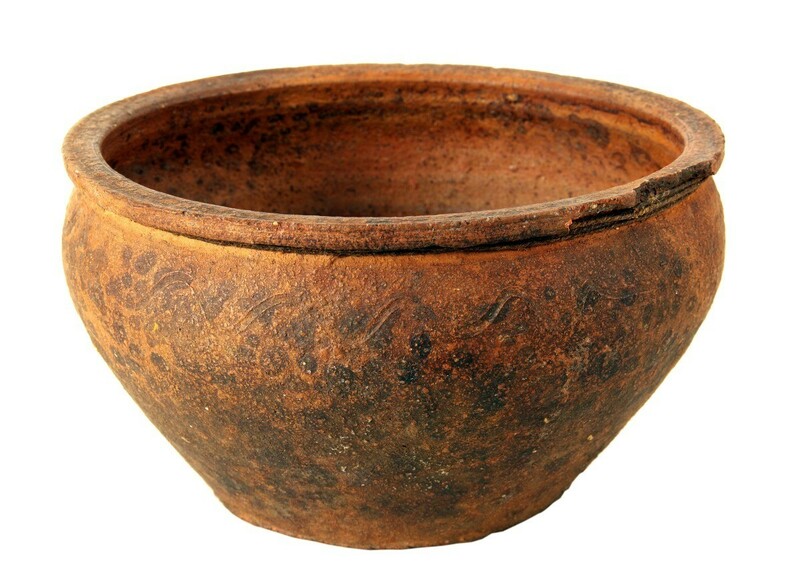 This is a guide about giving clay pots an aged look. How do you "age" clay pots with the crusty white and green patina? Tips from the ThriftyFun community. Collect mosses either from around your yard or a friends or neighbors. Finely chop the moss up. Allow the moss bits to dry up for a couple of days. When the mixture is good and smelly, brush it generously on the outsides of your clay pots. Then wrap the pots in plastic wrap and put them in the full sun. I read a few years back where a landscape hobbyist was painting his pots and stepping stones with copper sulphate for the dark blue-green aging that is so attractive. I'd love to do this to pots and rocks I have collected. The white comes by setting something in water and salt, I understand, but I'd be careful to rinse the inside out before planting in a pot done this way. Good luck and God bless you. Several years ago someone in a newsletter suggested plain yogurt. Outside, over newspaper, paint on the plain yogurt with a sponge brush, be liberal. Let 'set' for several days away from any living area. The ants will be very attracted to this, but after a while you will have a great greenish patina and your pot will look aged. I've done it and it is simple, just watch out for the ants at first. 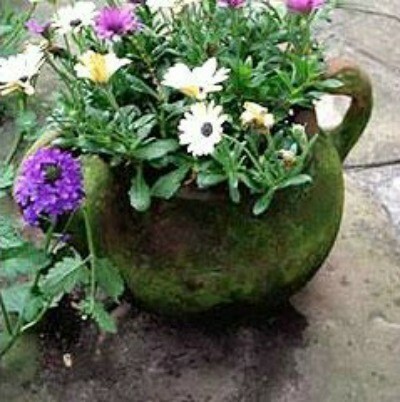 There are basically 3 ways to "age" pots: patina, paint, or moss. There are many patinas you can paint over your pots. Rust: If you want a rust look, you can paint the post with a paint that has real metal shavings in it or "magnetic" board paint. Then you make them rust by spraying or wiping them with vinegar, daily for about a week, then leaving them outside to rust. Copper: To patina them with a copper look, you paint them with a copper solution and painting on the acid type solution and waiting until it partially turns turquoise. The copper/patina solutions are usually sold in a pack together. Moss: To grow real moss on any pot, rock, or rock garden, cement container or directly on the soil in your garden on a shady place in your yard. You'll need to take plain yogurt or buttermilk and place one of these in a blender with the green type of moss they sell at craft stores (do NOT use Spanish moss). You can add a bit of water to make them blend easier. After blending the solution, pour this where you want the moss to grow. In a shady area and spray it with a mister to keep it moist every day. After about a month or so, if the conditions are right (not too hot and not too dry) you'll have real moss growing permanently on your pots! Yogurt, Moss and Glue (this is what you want): You slather on the plain yogurt, then glue on the moss with hot glue. Not as good as above, but it's instant, and no waiting for the moss to "grow". The yogurt will "age" in several weeks and look old. If you mix this method with the one above, you'll get a very cool look! Moss Look: You can make a pot look like it's rusted, mossy, or copper with metallic paint or paint and metal "leaf". To do a moss look, take your terra-cotta pot and some mossy colors of greens. Take a sponge, we it first the dip it in several shades of moss green. Lightly dab the mossy green paints around the top lip of the terra cotta pot, them spray or paint with a UV sealer like clear paint medium or a water based varathane. Use exterior sealer if the pot is going outside. Any high quality acrylic paint can be used indoor or outdoors. Rust Look: If painting a real terra cotta pot, first seal the pot with a clear water based sealer, if plastic, use a paint for plastics. Take the colors of rust and follow the above instructions. Paint entire pot with a metallic copper color of craft paint, then daub with a sponge the colors of teal and turquoise and a greenish turquoise around the lip of the pot and in a few places around the pot. Let one color dry, then daub the next until you are satisfied. After you are done, go back and daub a little bit of copper or bronze over the top of the turquoise colors. Use the same technique as above, only switch the colors. First, paint the pot with sponge paint the pot with differing shades of turquoise, then sponge over that with the metallic copper. You can also splatter (using a toothbrush) a bit of watered down black paint lightly over the pot in a few places. The quickest and easiest way is with paint, which is what I've always done. I just use thinned acrylic paints, brushed on and lightly sanded or wiped off. Of course there are other aging processes too, using milk paint, lime powder, buttermilk, or yogurt. All work in varying degrees. Just do a web search for aging terra cotta pots and you'll find lots of info. I loved all of your suggestions on how to age my terra cotta pots for my new herb garden! I did the one using lime and had great results, then tried the yogurt/moss technique and followed the instructions exactly. It's been four days now, and instead of moss, all that seems to be growing is black fuzzy mold. What went wrong? Has anyone else had this happen?